Diggers Valley: 5 November 2011. The week beginning the 5th of November 2011. 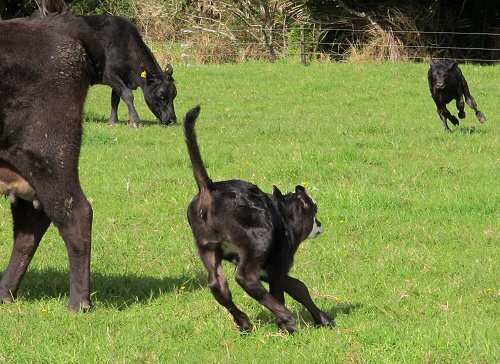 I love watching calves, they have so much fun going really fast! The way they run with their tails straight up in the air is very funny. Milking time. Stephan is measuring out Imagen's calf's milk into his bottle, while Imagen contentedly feeds her grand-daughter. Zella is still standing in the milking bail, probably licking out the last of the molasses from the Topmilk bin. 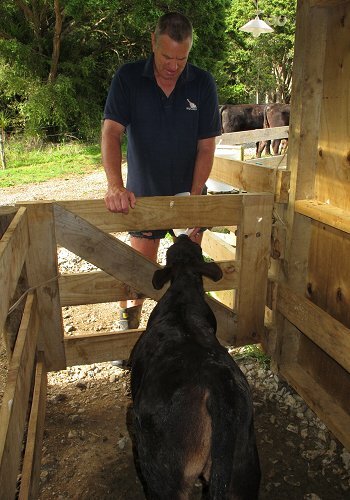 Feeding the calf. 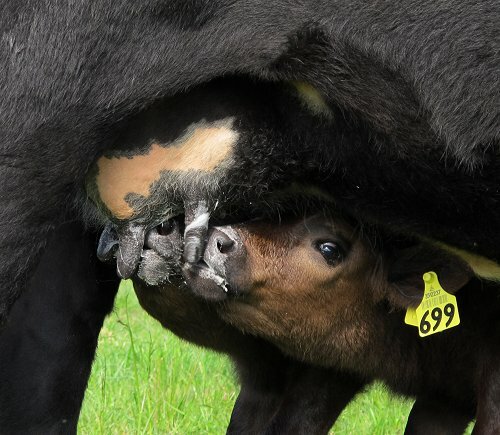 It's wisest to feed him through a gate, because his bunt is very violent when the milk is all gone! We'll have to set up some sort of automatic system, so he doesn't need to have someone stand holding the bottle for him for the next four months. As we were bringing the five bulls in to the yards for a copper injection this afternoon, I could hear the unusually urgent bleating of a lamb, sounding quite distressed. 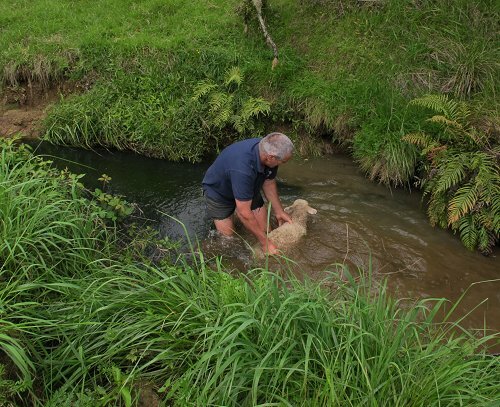 Three lambs were peering in the direction of the stream as we looked across from the driveway, so we quickly went to investigate. Goodness knows why one had fallen in, but she couldn't get out again and had swum across to the opposite bank where she'd become caught amongst some blackberry bushes. Stephan got into the water, untangled her and guided her back to the bank, before heaving her (they're very heavy with wet wool) back up the bank to her friends. She shook herself off and headed straight for her mother, Dotty, for a comforting feed. 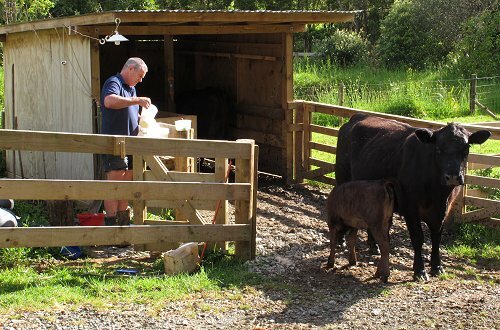 While the bulls were still in the yards, I phoned Lynn and Kees and asked them if they'd like to pop over for an inspection visit, since they want one of the bulls for their cows. They were conveniently able to come for a look and #98, son of Ranu 31 and #60, will be off on a truck in the next few days to become their new herd sire. 545's twins are doing just ok, looking a bit pinched for feed. They're both pulling as much as they possibly can from their mother, as they should, but with the grass growth being poor, she's not getting as much feed as I'd like her to have to feed them really well. It is fortunate that she has produced them as a mature cow, because she's not a tremendously good milker, and she will now be at her best in this, her fourth, lactation. 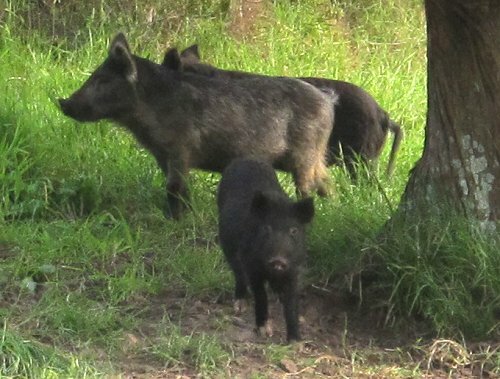 After checking the cows and calves in the Big Back paddock, I wandered back through the Bush Flat reserve, checking the Doc 200 trap on the way past. I believe this is rather an unusual catch in such a trap. 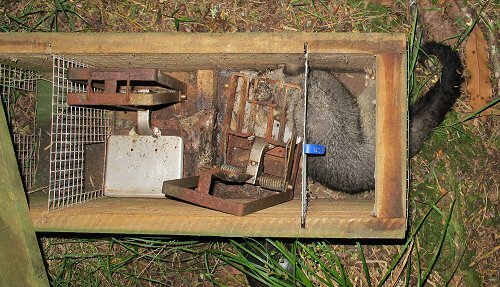 The possum would have had to work fairly hard to squeeze through the wire netting barriers (designed to deter Kiwi from investigating the traps) to get to the manky old bit of bait in the middle! The Windmill Paddock Putangitangi have two tiny chicks with them this evening. That's a very small family, compared with other years when they've had up to eight. 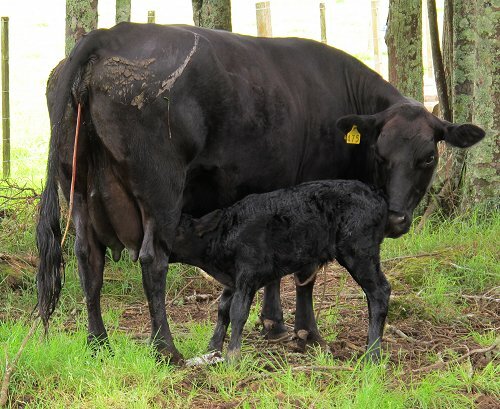 I found these two at noon at the top end of the Windmill Paddock, 475 having just delivered a bull calf and her daughter 572 in labour, quite determined that her new brother was her own calf and that she should claim it from her mother! I tried dividing them with some electric tape, but 572 kept pushing straight through it to get to the calf, so I resorted to fending her off with a fence standard, as an arm extension primarily, but used for the occasional knock on the nose when she got too enthusiastic in her attempts to get past me to the calf. 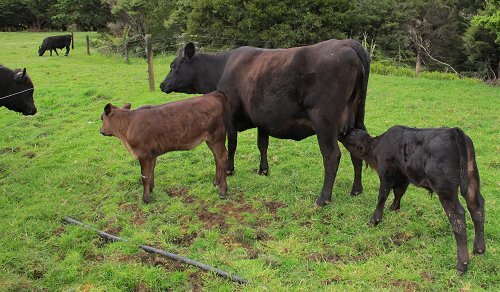 Eventually I managed to get 475 and the calf over to the fence, pushed the calf through underneath the bottom wires, then "encouraged" 475 to go up to the gate and around into the lane to claim her calf again on the other side of the fence. Things were all very confused for a while! I'm very fortunate in having cows with very good temperaments. I was well aware that there was but a hair's breadth between safety in what I was doing, and serious danger and I hoped I could tell the difference between the two moments and get out of the way if I needed to. But both mother and daughter are lovely cows and neither saw me as a threat to the calf, despite my being right in the middle of things. Thankfully, once out in the lane, 475 took her calf away from the fence and into the stand of trees, where he soon worked out where to have his first feed and I stood in the line of sight between 572 and this calf, hoping 572 would be distracted by her own labour and return to the job at hand. 572 did eventually have to give in to what was going on at her other end, and laid down and delivered her own calf, by which time she was fortunately no longer quite so distracted by the other calf and got on with mothering her own. 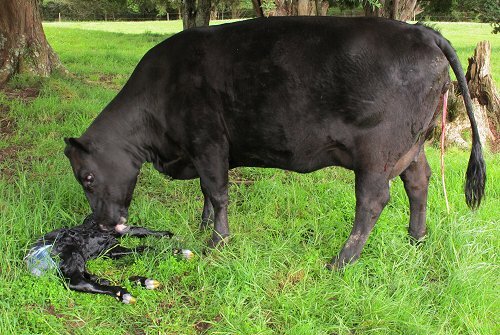 I'm very glad this fat four-year-old has successfully calved. If her first calf, 528, is any indication, this one should be a good animal - a bull, which we'll castrate and sell as a steer weaner in autumn. The big bulls were a pain in the neck, fighting each other all the time when we took them in for the copper injection the other day, so I'd sent them back to their original paddock on their own and kept the three yearlings by themselves. Today I put the three youngsters into the Camp paddock to await notice of the truck coming to collect #98. 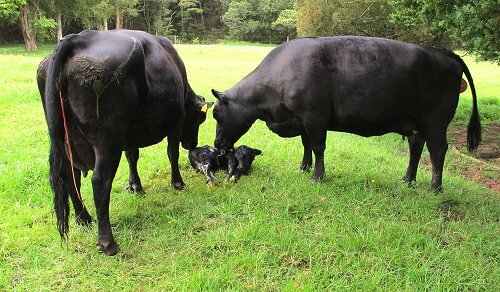 On the other side of the fence in the House Paddock, Zella was so distracted by her "conversation" with a bull at her front end, that she didn't notice what the bull at her rear was up to and Imagen's calf got in for a good feed! The calf has been much more adventurous about finding milk since we introduced him to 486 last week, so although we were not successful in that attempt to find him a surrogate mother, we may have improved his ability and willingness to try with Zella. I walked up one side of the Big Back paddock this afternoon and disturbed these four rooting around the base of some big trees. 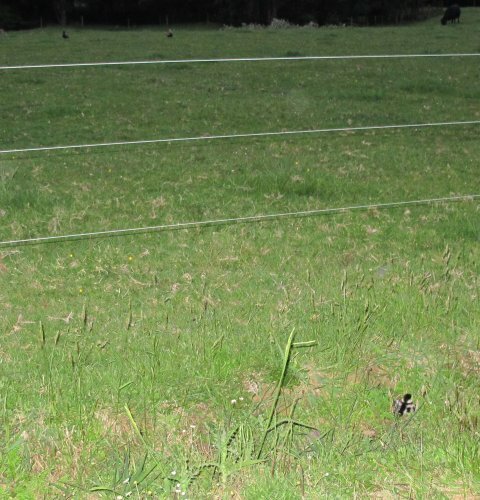 When I came back down the other side of the huge paddock, I spotted them again. They must have crossed the swamp at the bottom and come up the other side. Why is that pig looking at me as if I'm not supposed to be here? The NCEA (National Certificate of Educational Achievement) external examinations began in secondary schools around the country today and as manager of the Kaitaia College exam centre, I was there, facing a sea of nervous faces, as they readied themselves to open their first papers. 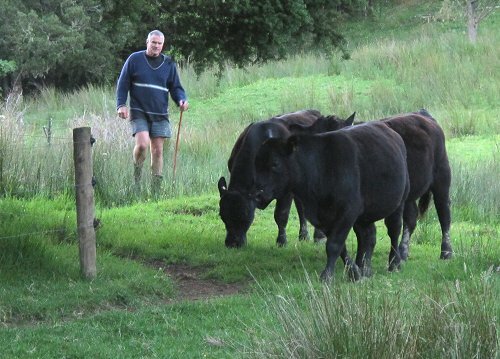 The truck is coming to collect bull #98 early tomorrow, so we went out and walked the three bulls in to the yards. For some reason, the NCEA exam timetable programmed no exams for today and luckily for me, the day was beautifully sunny and warm! The truck driver arrived exactly on time to take the bull away to Lynn's place, the driver was intelligent, polite and sensible and everything went really smoothly. Having had some really horrible experiences when sending cattle off on trucks, I always approach the job with trepidation, usually leaving it to Stephan if I can; but this morning, I was here and he wasn't. The orchids are out. I counted 76 flowers and buds in this group this year. I can't find where I wrote down how many there were last year. 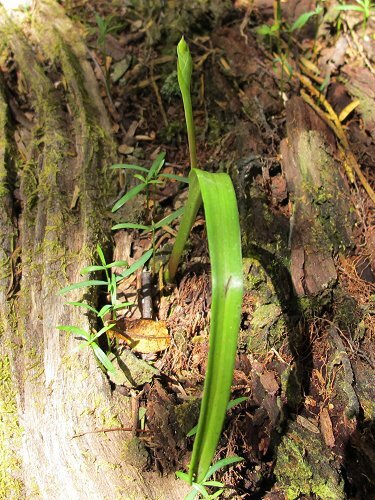 I went out to look around the patch of orchid leaves I'd found under some trees by the stream in the Back Barn Paddock, and found a number of buds. 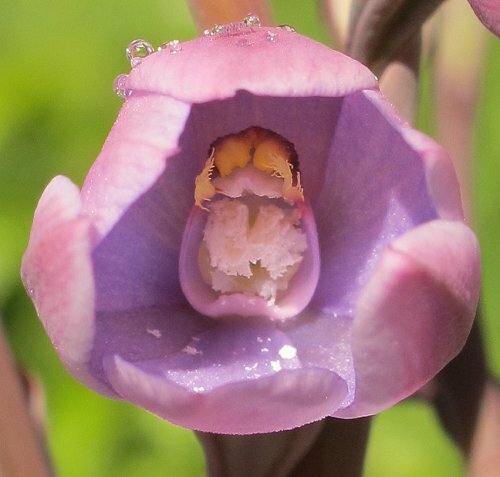 This one was on the verge of opening, so I nudged it and then saw that it looks slightly different from the ones of this type I've seen before: it has pink in its petals! 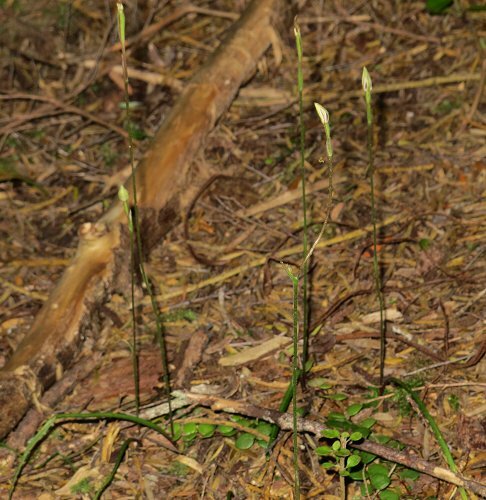 Over the stream were a few of the Thelymitra (Sun orchid) plants. Hopefully I'll get to see them in flower. 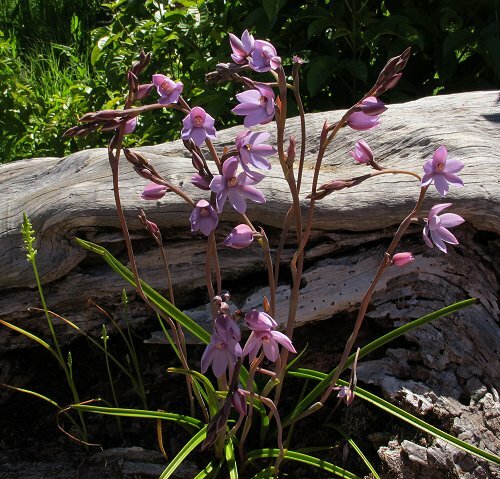 Some of those I'd previously found as small plants, have dried up and died during the long dry period. 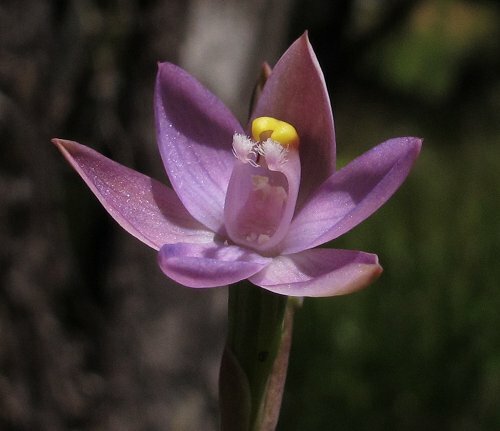 Up the top of the Big Back Paddock is a population of Sun Orchids, of this pinky-purple colour. There was another flower, almost open, of a slightly bluer hue. 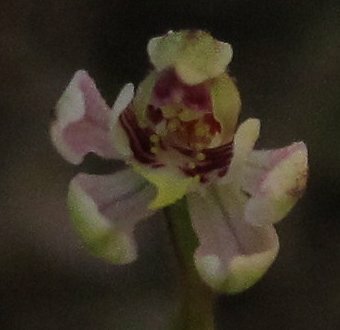 The obvious differences between this and the orchid at home are the smoothness of the hood of the column, and the colour and appearance of the cilia (pale yellow in the orchid at home, white in this one). Riding back home I startled the Paradise duck family who were sitting near the track down the side of the Windmill Paddock. The parents both dashed off into the paddock, leaving their confused and frightened chick (I note they've lost the other one of the original two) to fend for itself. It huddled as flatly into the ground as it could manage and stayed completely still, obviously hoping I'd not see it. The light was poor, but I wanted to catch the sense of distance between useless parents and poor baby! The parents are the two birds in the top left corner of the photo, the baby at the bottom right, just beside the metal track.